I love pandas. A lot. 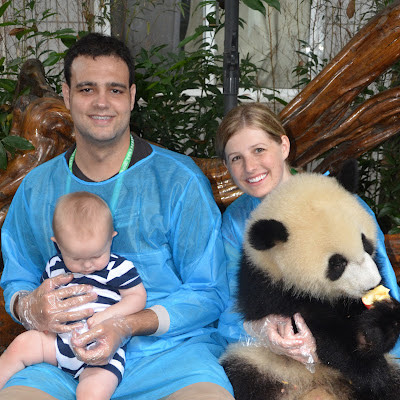 When Fabio and I were first married, I found out China was looking for "Panbassadors" (panda ambassadors) to live in the Chengdu Panda Breeding Center and raise awareness of the endangered species, and I immediately started to apply. Fabio asked what I was doing and I told him I was applying to be a Panbassador. Fabio: "To live in China?" Me: "Live with pandas in China. And only for six months." I eagerly clicked away until I realized they expected the Panbassadors to speak Mandarin. Cue sad-Charlie-Brown-music and imagine a crest-fallen Katie. 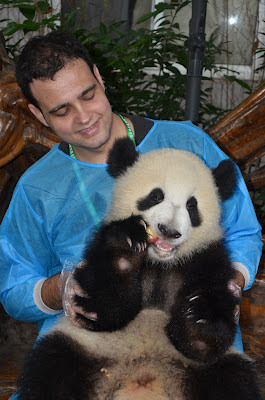 I consoled myself by resolving to someday go to the Breeding Center in China to hold a panda cub myself, Panbassador or not. It's been one of those bucket-list, picture-on-the-fridge type things for me. Fast forward to about a year and a half ago, when Fabio approached me about moving to Singapore. He told me about the amazing faculty at NTU and the wonderful resources and research opportunities he would have. I listened for a while and then asked the million dollar question: "How long does it take to travel from Singapore to Utah?" Because, you know, my Mom lives in Utah. He looked online and sheepishly answered, "Um, 30 hours. But we would be able to travel the world and see all sorts of amazing things!" Me: "But we've never been to Singapore. How do you know we'll like it there?" Fabio: "Because we like adventures, and we've never been anywhere we didn't like." Fabio: "If we lived in Singapore, we could go to Chengdu and hold a baby panda." Me: "Promise? You promise that if we move to Singapore we will budget enough for me to fly back to Utah three times a year and you will take me to Chengdu to hold a baby panda?" Me: "Okay. Then we can move to Singapore." So when Fabio had two conferences in China with three days in between, he decided to make good on his promise and fulfill one of only two conditions I had for moving here in the first place. 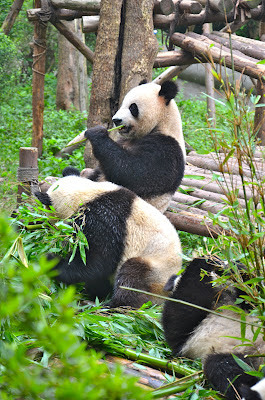 We got to Chengdu in the late afternoon, well after the pandas were sleep for the day. So we postponed our panda day to the next morning and just wandered around the huge, bustling city with our guide, Haba, learning about the history and culture of Sichuan Province. When we got back to our hotel that night, I couldn't sleep. It was like Christmas Eve and then some. I tried and tried, and finally prevailed upon myself to drift to sleep through the flashing lights of Chengdu's skyline. Then next day we got up early, made sure the battery was in the camera, and bounced to Haba's van to drive to the Panda Breeding Center. Well, I bounced... Fabio and Jonathan were still trying to shake the 7:30 am cobwebs out of their heads. We had to get there early because they only let so many people hold a cub each day. Then we went to the cub enclosure, and they were even more adorable! Then we stood in line at the "donation center," which is really their polite name for "the place where you pay extra to hold a panda cub." We put on the surgical gowns, gloves, and footies, and then before I knew it one of my all-time-life-long-cannot-die-before-this-happens dreams was fulfilled! I was actually holding a panda cub in my arms. When they put the "little" 9-month-old on my lap he even snuggled into me. It was amazing--everything I imagined and more. And even now as I load the pictures, I still can't believe it really happened. I think Fabio got his money's worth for the whole trip from this one happy-Katie-face. Go ahead. Tell me I wouldn't have made an amazing Panbassador. When the workers saw Fabio and I trading Jonathan to take turns holding the cub, they offered to take a family picture. The panda didn't move enough for Jonathan to be impressed. Fabio was the hero of the day, week, month, year... and he knew it. Just look at that grin. After a day of pandas, we did some shopping at a "tourist" market. Except the only tourists that go to Chengdu are Chinese. They're mostly villagers and farmers that come to the city for holiday. So Jonathan's fan club was in full overwhelming force. Haba told us that for many of the people there, it would be the only time they saw a western baby in person their entire lives. One of my favorite moments was as we walked around the market and a beautiful little girl looked at me then stopped dead in her tracks. She pulled on her grandpa's pant leg, pointed at me, and started chattering. Haba translated for me: "Grandpa! Grandpa! Her hair! It's different!" I got down on my knees and invited her to touch it. She hesitated, but couldn't resist. She stroked it so gently and tenderly, and then she asked Haba, "Is it made of gold?" So adorable. I couldn't get over how cute and clever this baby carrier was. 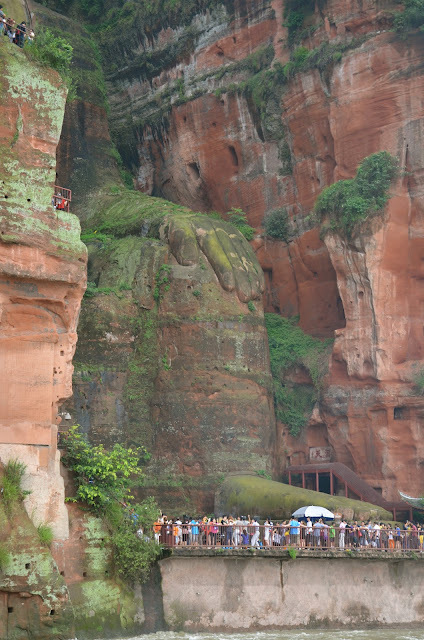 On our last day in Chengdu, we did a "Fabio thing" and went to the world's oldest and largest sitting Buddha, about two hours outside of Chengdu in a town called Leshan. Fabio has an affinity for the "world's largest" anything, so we made the trip. 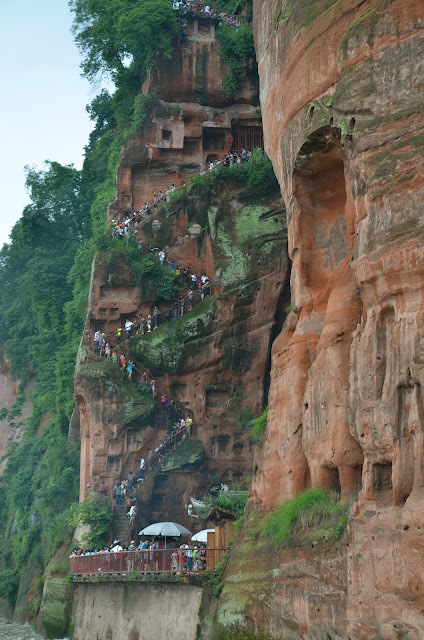 The Buddha was carved by hand out of the cliff's walls 1,200 years ago to protect the fisherman. It's at a juncture of two large rivers that eventually feed into the Yangtze and the waters are very turbulent. It's easy to imagine why they were losing a lot of fisherman and thought some kind of protection would be helpful. We skipped the two-hour line to scale the harrowingly-steep and over-crowded Indiana Jones staircase you can see in the picture, and opted to see the Buddha by boat instead. While we waited for our boat, we wandered Leshan's wet market. It was like stepping back in time. The town is almost untouched by any western influence. The men used abacuses and hand-made scales. The women carried huge baskets on their backs. The butcher chopped pig feet on a tree stump and the vegetables were laid out on the street. People stared at us as much as we (despite our best efforts not to) stared at them. As we drove back to the hotel through rice paddies and tea plantations with pointed straw hats peaking out of the crops, it finally hit me what was happening: that we were in China and I held a panda the day before, and that we had just seen a 1200-year-old Buddha by boat, and that we would be the only white people many, many families ever saw. I was so happy we chose to come to Singapore and that we've been able to take advantage of such special experiences as a family. And then it hit me that our trip was only half over. Katie, you would have been the best Panbassador ever! Are they heavy to hold? I love that it was a dream come true for you. Looks like you guys are having so much fun, I am so jealous of all your adventures. Wow. What an adventure. And you've fulfilled one of your dreams! I wish I could also carry that cute little panda. You look like you truly love what you are doing. :) What a family outing/bonding you had. Wow, wow wow! First, let me say I love your descriptions. I totally could hear the sad Charlie-Brown music when you realized Panbassadors had to speak Mandarin. So glad your life dream was fulfilled. Reminded me of that celebrity on Ellen who freaked over seeing a sloth. And that Buddha was huge! Looks like something out of Lord of the Rings. The panda looks SO sweet. 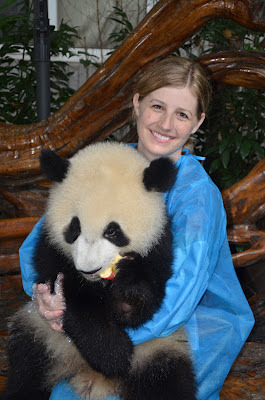 I can only imagine how amazing it was to hold the panda. The other parts of the trip look fun too. Oh! This blog brought me so much happiness just to see your happiness! (I know, super cheesy, but whatev) Your family is just so cute and I LOVE reading about your adventures. I don't kno how I missed this post, but I'm so glad I saw it and that your dream of holding a panda cub came true!